Hydroseeding is a simple process that quickly produces a beatiful lawn. Hydroseeding is really a pretty simple process. Water, seed, fertilizer and and a protective mulch is mixed in a tank and sprayed onto the ground. The early machines worked well, but were expensive enough that only big seeding jobs could be economically justified. 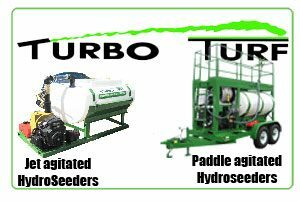 In the last decade much more affordable machines have come on the market, and the advantages of hydro seeding are affordable to most any seeding professional. Well, lets look at what exactly is in the mix that is sprayed onto a hydro seeding job. Seed used in a hydro seeder doesn’t need to be anything special. Nearly any seed can be used and at the same application rate as other seeding methods. These can include grass or lawn seeds, wildflowers, pasture seed, seed for athletic fields and seeds for erosion control such as crown vetch. Hydro seeding mulch is what gives it the green color. It does more than just make it pretty, it helps protect the seed, and to seal in moisture. It may be made from a paper or wood product or a mix. If any accidentally gets on your walkways, driveways or house, it will not stain and can be washed off, or will just disappear on it’s own.